If you’re thinking that sipping a cocktail at Saint Tropez’s most famous terrace Senequier is a tad too eccentric, a Basilic Burger will more than likely hit the spot. Walk away from the harbor into the little streets and alleys and look for a tiny little restaurant that astounds you with it’s charm. 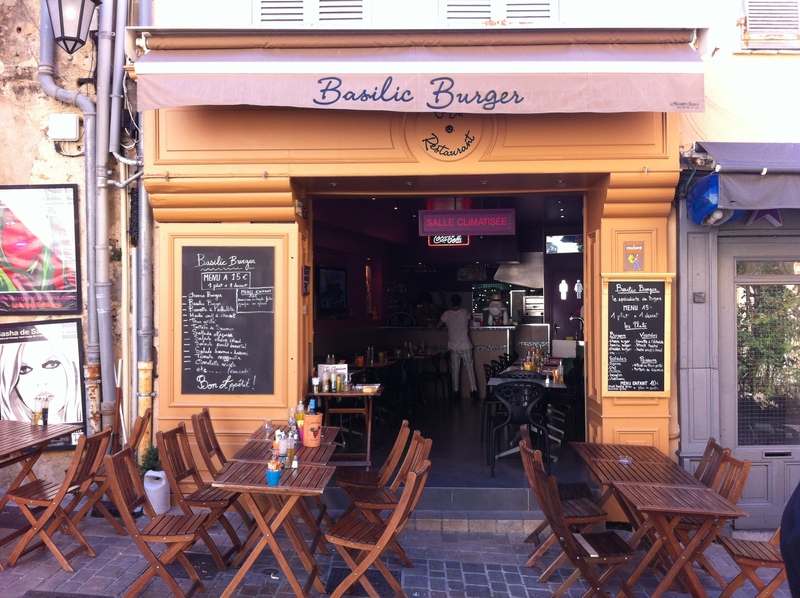 Truthfully, the little alleys around Place des Lices are all packed with charming restaurants and cafe’s, but if you stumble upon a yellow facade with chalk board menus on the wall, this will most likely be Basilic Burger. It is located on a tiny square called Place des Remparts. House specialty: burgers. Recommended: their Basilic Burger, a burger topped off with fresh mozzarella, tomato and basil. The fries arrive in a cute mini frying basket. Order a fine boteille de vin blanc to accompany this delicious meal. Who needs big 10 million dollar yachts to look at and 18 euro cocktails to sip from when you have this fantastic little burger bar just around the corner?